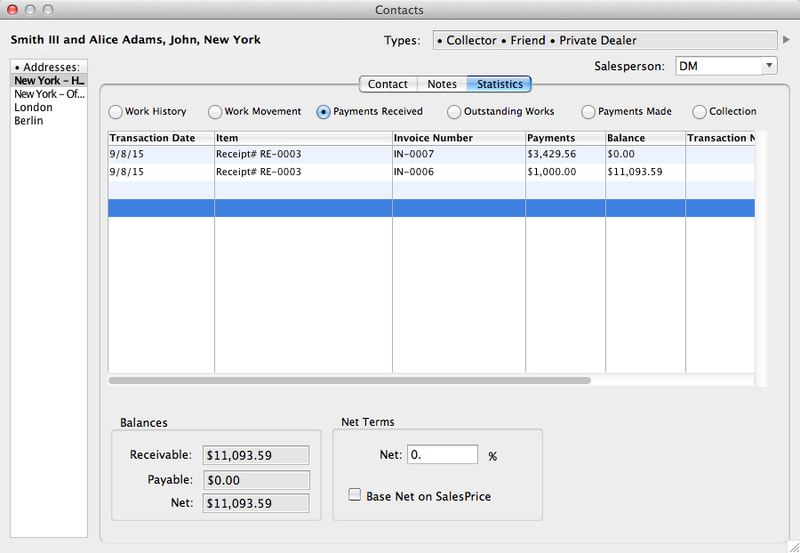 Contacts is an efficient contact manager directly linked to Works, Transactions, and even References data. Virtually any name and address needed for any business or collection purpose should be entered into Contacts. Pro will correctly format and make accurate use of that information at all levels.When one adds a work or creates a transaction in Pro, it asks to select sources and locations from a list of Contacts. If a contact is new, it can be added 'on the fly'. Pro will automatically enter the related data, such as address and standard recorded client discount. All entries and changes are updated at every applicable level of the program. Contacts is flexible. 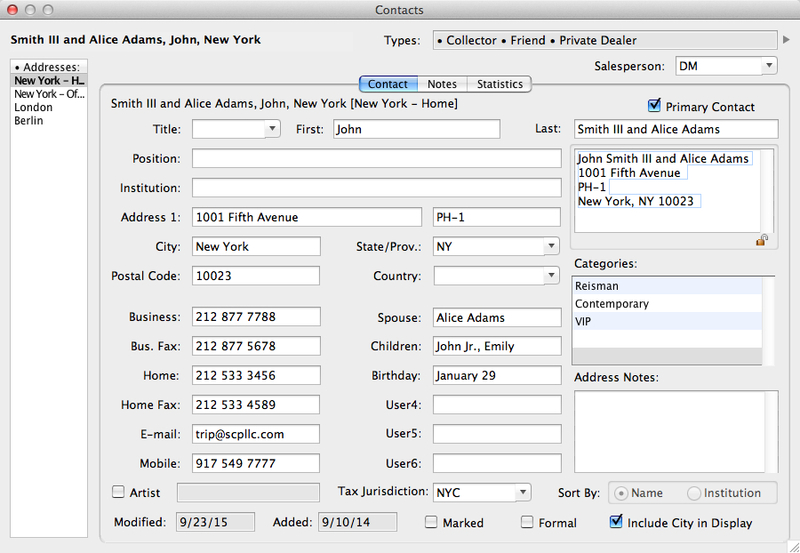 Besides the many standard fields, there are twelve user-defined fields (create the field names) for phone numbers, email addresses, assistants names, birthdays, or any other contact data. 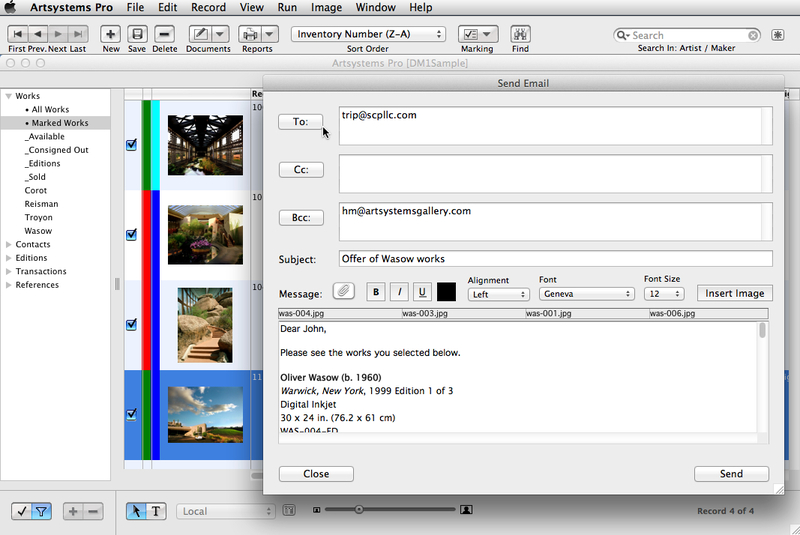 Contacts also provides a user-defined Categories list for grouping contacts by multiple 'tags' such as for artist or style interests, mailing type, or status. 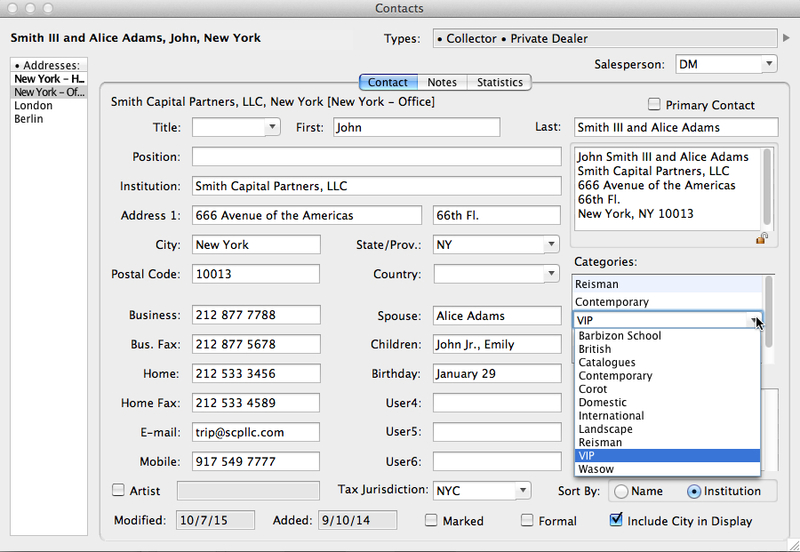 Contacts also can be defined by Types such as Collector, Artist, Museum, Vendor, and/or Dealer. Together with selecting geographic regions, purchases, salespersons, etc., Contacts can be filtered to very specific groupings and can save filters for real-time information. The Statistics tab is a great snapshot of the business with a contact, linking to each of its listed Transaction records in one click.The Work History section of Statistics specifically lists all of the offers, consignments, and invoices made to the contact.The Work Movement section of Statistics lists and links to all shipments and returns to and from any of the contact's addresses. 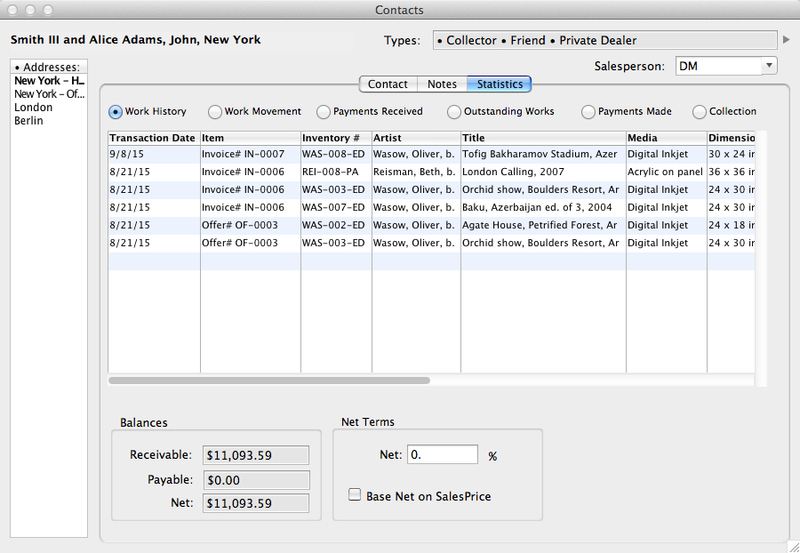 Contacts Statistics also includes all accounting history for the contact by artwork in sections such as Payments Received, Outstanding Works (payments owed), and Payments made. Listings include all related details and link to transaction records.The Statistics tab also displays the contact's balances, with total receivables, payables and net. Here, also, a contact's 'Net terms' can be defined, which automatically populates a specific discount for the contact when an offer or invoice is created. See Pro Accounting section for more information about accounting in Pro. The Collection section in Contacts Statistics lists and links to works entered in the Works module that are or have been at one time in the contact's collection.When a contact purchases a work in the database, the work is automatically added to this section. 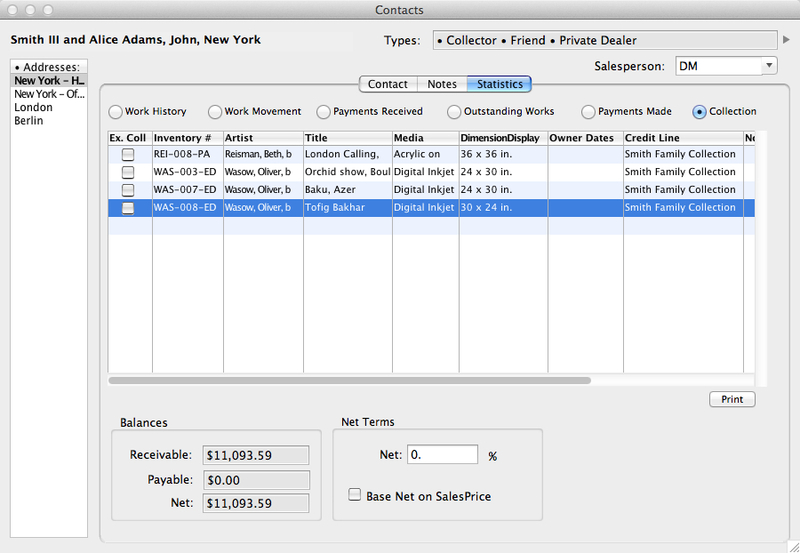 Simultaneously, the contact's collection information is automatically added to the Provenance section in the work's record. Write correspondence directly from contact records and make editable offers of selected works via built-in Email or Microsoft Word (as the integrated word processor). Automatically save letters and emails within a contact's records, along with scans or PDFs of other correspondence and additional documents, photos, and other files.